The parliament suspension means Wickremesinghe will not immediately have an opportunity to prove his majority, amid speculation that some of his party members would cross over to back Rajapaksa for perks and ministerial portfolios. Colombo: Sri Lanka’s President Maithripala Sirisena on Saturday suspended parliament till November 16, a day after removing Ranil Wickremesinghe as prime minister and replacing him with former leader Mahinda Rajapaksa in a surprise move that signals escalating political tensions in the South Asian nation. “The president has prorogued the parliament,” cabinet spokesman Rajitha Senaratne told reporters. Minutes earlier Wickremesinghe, who says he remains prime minister, urged the speaker to convene parliament to prove he retained his parliamentary majority. “I have the majority in the parliament, convene the parliament to resolve this,” Wickremesinghe told a press conference in Colombo on Saturday, flanked by all his coalition partners except Sirisena’s party. “Only parliament can show who has the majority,” he said. The island nation’s Media and Finance Minister Mangala Samaraweera on Friday condemned Rajapaksa’s appointment as “an anti-democratic coup” and violation of the constitution. A delegation of the European Union said on Saturday that it was closely following the events in Sri Lanka. Sirisena administered the oath of office to Rajapaksa on Friday after sacking Wickremesinghe, who was away touring the south of the country. Under Sri Lanka’s constitution, the prime minister heads parliament and the president has executive powers. The political rift, which comes amid weakening economic growth in Sri Lanka, follows months of infighting in the ruling coalition. Relations between Wickremesinghe’s United National Party (UNP) and Sirisensa’s United People’s Freedom Alliance (UPFA) have been strained recently after Sirisensa criticised Wickremesinghe’s for not adequately investigating an assassination plot against the president. The UPFA had threatened to quit the ruling coalition. Sirisena accused India’s intelligence services of involvement in that plot, a claim New Delhi and Colombo have both denied. There was no immediate reaction from India which has long seen Sri Lanka, located just off its southern tip, as part of its area of influence. India’s foreign ministry did not respond to a request seeking comment on the change of leadership in Sri Lanka. 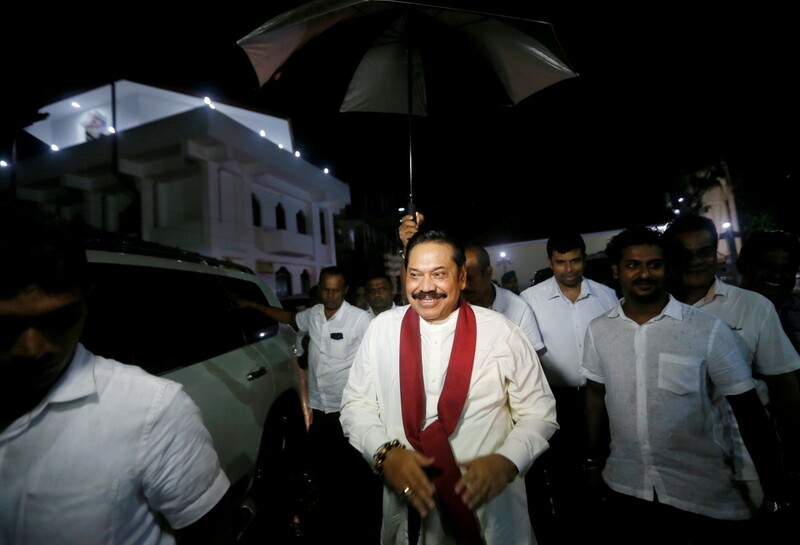 India has been concerned about Rajapaksa’s wooing of China — he ushered in billions of dollars of investment from Beijing to help rebuild the country following the end of a 26-year-long civil war against Tamil separatists in 2009. That investment has since put the island nation deep in debt and forced it to hand over control of a strategic southern port to China, drawing criticism from India and the US.